We sell Kevlar sewing threads in both industrial size cones and domestic bobbins and in a variety of weights / widths. Kevlar is a para-aramid fibre made by Du Pont which has remarkable properties. The spun thread is 5 times stronger than steel thread (by weight), it does not melt, it is self-extinguishing, is flame resistant (but not fireproof), and will withstand temperatures up to 425° C continuously. Kevlar thread has numerous specialist applications including: Sewing of heat and blast furnace protection wear, fire-fighter clothing, racing car driver clothing, personal protection equipment such as cut and ballistic protection - it is used in cut protection gloves and bullet-proof vests etc. 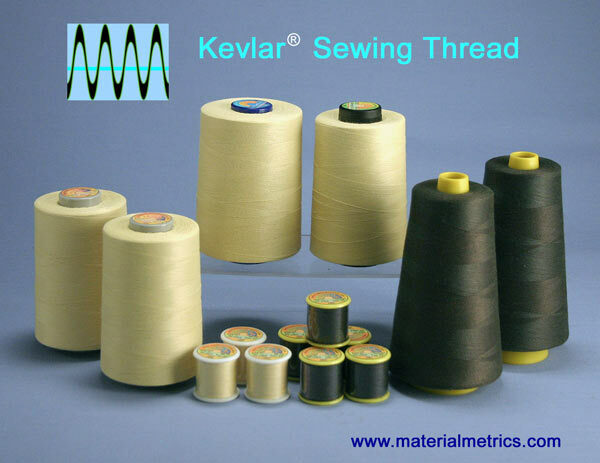 Kevlar thread also has uses in the media and entertainment sectors where fire is used, such as fire-juggling and other fire performance equipment, as well as many other applications including model making, musical instrument repair, camping and survival uses etc. The possible uses are endless. 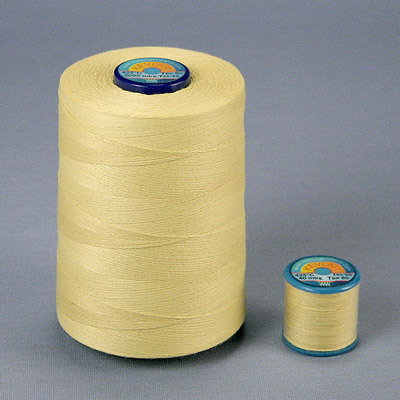 Our kevlar threads are suitable for either hand sewing or machine sewing (including both domestic and industrial sewing machines). The higher the Tex number, the thicker the thread. 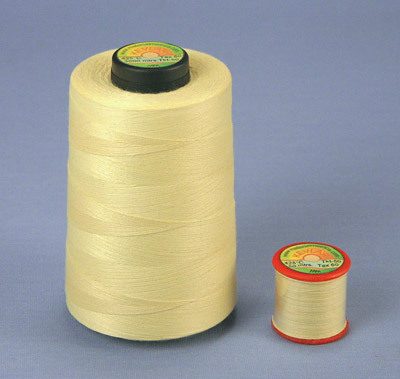 As an approximate guide, Tex-40 is equivalent to most ‘normal’ domestic sewing thread widths. Please see the chart for full specifications of performance and weight. Our kevlar threads are not waxed and they are also not suitable for unravelling to produce magicians’ invisible thread. We pack all our kevlar threads in black polythene bags to ensure that they are in pristine condition when received. All kevlar products are effected by strong UV light and will lose strength if left exposed to sunlight or UV for long periods. Kevlar will also degrade in contact with chlorine (such as bleach products and swimming pools). 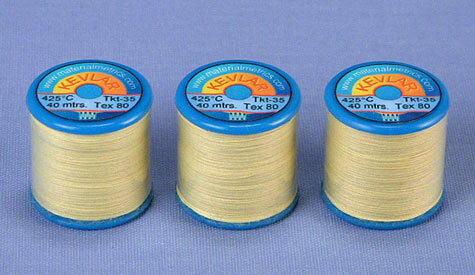 Tex 40 Kevlar sewing thread (strong). Natural yellow. 1 x 50 metre bobbin. Natural yellow. 1 x 5000 metre industrial size cone. Natural yellow. 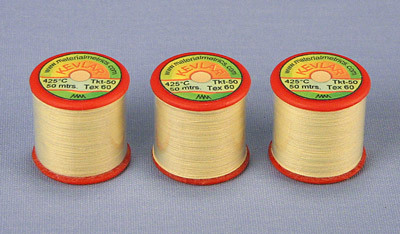 3 x 50 metre bobbins. 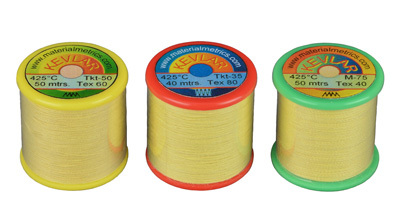 Tex 60 Kevlar sewing thread (very strong). Natural yellow. 1 x 3000 metre industrial size cone. 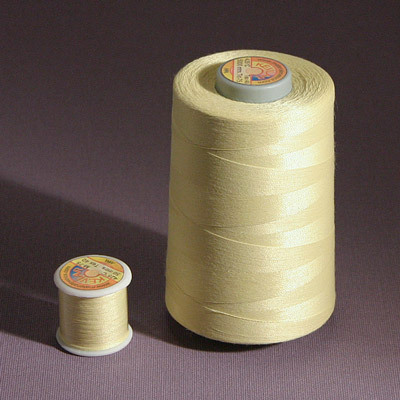 Tex 80 Kevlar sewing thread (extremely strong). Natural yellow. 1 x 40 metre bobbins. Natural yellow. 3 x 40 metre bobbins. Natural yellow. 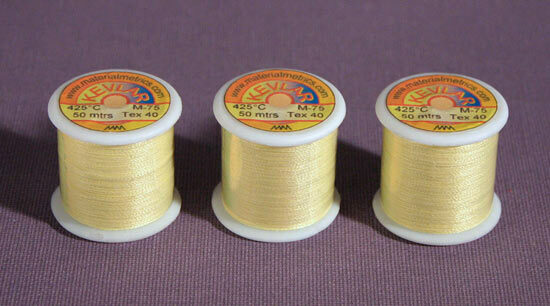 1 x Tex-40 50m, 1 x Tex-60 50m, 1 x Tex-80 40m bobbins. Total 140m.